Our planet is a gift that we have all been endowed with. Though we live here it doesn't belong to just us. It belongs to future generations of humans and animals. We believe that it is our responsibility to care for it. There is much we don't have control over, however we believe that it is still our responsibility to do our best in caring for the earth. 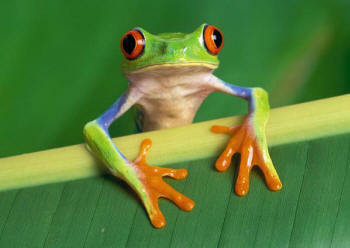 At Green Planet Carpet Care, we have chosen the iconic red-eyed tree frog for our company logo. Red-eyed tree frogs, despite their conspicuous coloration, are not venomous. Frogs and other amphibians live most of their lives in water, making them very sensitive to waterborne chemicals, which are absorbed through amphibians' permeable skin. For this reason, frogs often give the first warning of toxic pollutants in the environment. Some surprisingly common substances, such as the plastic in baby bottles and the pesticides in crop sprays, contain chemicals that inhibit normal amphibian development. Frogs can tell us a great deal about determining safe levels of pollutants in the environment. In the same way that frogs are exposed to pesticides and hormones in the environment, people are also exposed. At Green Planet Carpet Care, you can be sure that we only use non-toxic and environmentally friendly cleaning products in your home so that you and your family are never exposed to harmful chemicals. In fact, the largest part of our cleaning process uses only hot water and steam to clean your carpets and tile. The frog in our logo is a constant reminder about our commitment to your familyâ€™s health and the environment.